President Obama dares Republicans to help build a "thriving middle class," reform immigration and curb gun crime in State of the Union. 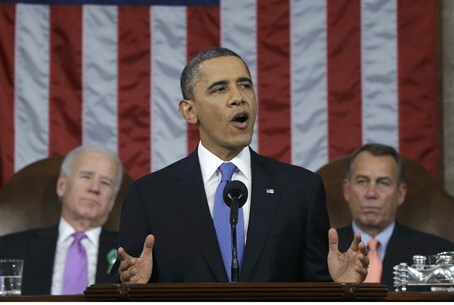 In the annual State of the Union address on Tuesday night, President Barack Obama dared Republicans to help build a "thriving middle class," reform immigration and curb gun crime. Obama, wagering political chips he won in November's election, told Americans he will halve the number of U.S. troops in Afghanistan within a year and gave his first on camera response to North Korea's nuclear test. At the same time, he said, “We gather here knowing that there are millions of Americans whose hard work and daily determination have not yet been rewarded. “Our economy is adding jobs – but too many people still can’t find full-time employment. Corporate profits have rocketed to all-time highs – but for more than a decade, wages & incomes have barely budged. "It is our generation's task, then, to reignite the true engine of America's economic growth -- a rising, thriving middle class," said Obama. "Now we need to finish the job. And the question is, how?" he said, adding, “We can’t ask working families to shoulder the entire burden of deficit reduction while asking nothing more from the wealthiest. We won’t grow the middle class simply by shifting the cost of health care or college onto families that are already struggling. "We should do what leaders in both parties have already suggested and save hundreds of billions of dollars by getting rid of tax loopholes," said the President. Obama announced the opening of three new manufacturing hubs, such as the one opened last year in Youngstown, Ohio, in order to create jobs. He proposed a “Fix-It-First” program to fix the nearly 70,000 structurally deficient bridges across the country. “Part of our rebuilding effort must also involve our housing sector,” said Obama. “Today, our housing market is finally healing from the collapse of 2007. Home prices are rising at the fastest pace in six years, home purchases are up nearly 50 percent, and construction is expanding again. He also spoke of education, proposing working with states to make high-quality preschool available to every child in America. The issue of gun control also came up in the speech, with Obama saying, “Senators of both parties are working together on tough new laws to prevent anyone from buying guns for resale to criminals. Police chiefs are asking our help to get weapons of war and massive ammunition magazines off our streets, because they are tired of being outgunned. He also addressed Iran and North Korea’s nuclear programs, saying, “America will continue to lead the effort to prevent the spread of the world’s most dangerous weapons. The regime in North Korea must know that they will only achieve security and prosperity by meeting their international obligations. Provocations of the sort we saw last night will only isolate them further, as we stand by our allies, strengthen our own missile defense, and lead the world in taking firm action in response to these threats. Obama mentioned Israel only briefly, in a short statement on the Middle East.